The Lake County wine region currently has over 35 wineries and surrounds Clear Lake, the largest natural lake in California. There are five distinct appellations here containing almost 9000 acres of vineyards. 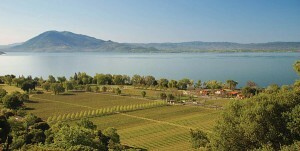 The largest, the Clear Lake AVA, also includes the subappellations Red Hills and High Valley. The Guenoc Valley AVA and Benmore Valley AVA are the other appellations located within county lines. The primary varietals grown in Lake County are Cabernet Sauvignon and Sauvignon Blanc, but you will also find many others including Chardonnay, Merlot, Petite Sirah, Syrah, Tempranillo, and Zinfandel. Lake County Winery Association – Association of wineries in the County. Lake County Winegrape Commission – Organization focused on marketing the region to new and existing grape buyers and wineries, as well as assisting growers in a variety of activities.